Cinema, for me, has always been something like music composed with photographic images. Others see it more like "action painting," and we've seen a lot of discussion in recent years about what J. Hoberman and others have called "post-photographic cinema," in which computers have replaced cameras, and animation has replaced photography, as the primary means of creating images on a screen. (Hoberman: "With the advent of CGI, the history of motion pictures was now, in effect, the history of animation.") "Flight" is Robert Zemeckis's return to live-action photography for the first time since "Cast Away" (2000), after a series of IMAX 3D animated adventures: "The Polar Express" (2004), "Beowulf" (2001) and "A Christmas Carol" (2007). It's also a return to making movies aimed at an adult audience -- and one that proved to be a different, and more interesting, than the movie I'd seen advertised in the trailer. I think it was before "Argo." I walked into the auditorium after the trailers had started (I don't like to watch them) and was looking for a seat by the light of the screen. 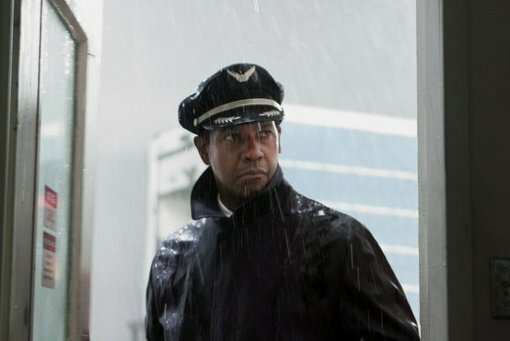 The movie in the trailer I half-saw appeared to be about a pilot (Denzel Washington) who made an amazing, Sully-like landing when the commercial jetliner he was flying experienced a mechanical failure, became a celebrated public figure, and was then accused of having alcohol in his system while he was in the cockpit. My impression from this trailer was that the movie was about him trying to defend himself against the charges. 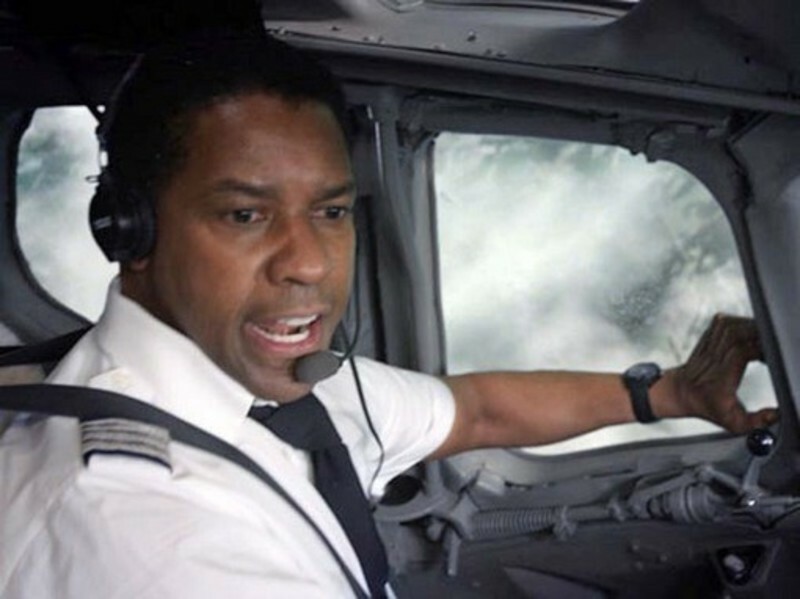 John Goodman tells him he's a national hero; Don Cheadle tells him nobody else could have landed that plane. I also assumed (though I didn't think it through consciously) that the accusations were false (maybe somebody was framing him!) and that he would be cleared at the end of the picture. That's not the movie I wound up seeing. First off, it begins with a hung-over Whip Whitaker (Washington) naked in a hotel room bed with a pneumatic knockout who is revealed to be a flight attendant (she isn't wearing her uniform, initially) named Katerina (Nadine Velazquez). They've only got about an hour before their flight, so Whip takes a swig of beer and a little bump to get him up and running. Once he meets his straight-laced, mustachioed young co-pilot Ken (Brian Geraghty), "Flight" takes a sudden detour into the life of Nicole (Kelly Reilly), a young woman jonesing for a fix. What do these two have to do with each other? Nothing... yet. In fact, Whip and Katerina are in stormy Orlando, about to take off for Atlanta, which, as it turns out, is where Nicole lives. But Whip and Nicole aren't introduced, as it were, until Whip's plane is going down. Nicole ODs in her rent-overdue apartment and the scumbag manager discovers her. 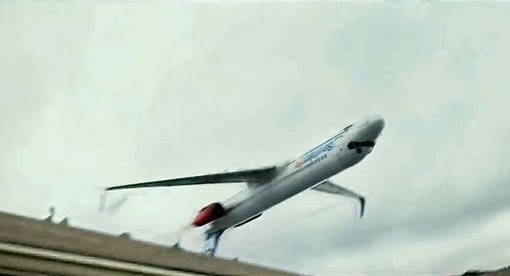 As the paramedics are taking her out in a gurney, a low-flying plane passes overhead... upside-down. This is probably the most striking image in the movie (another, a close-up of an airline-sized bottle of Ketel One -- product placement! -- on top of a hotel mini-bar fridge, provided Manohla Dargis with her review lede), but you may forget that it starts on Nicole. The shot works in several ways: In plot terms, it explains how these two characters' fates are intertwined -- how both of them landed in the hospital where they will meet face-to-face for the first time. It traces the thematic connection between Whip and Nicole, two addicts, who are about to hit bottom. And the visual thrill is magnified because of the perspective (the camera tilts up from Nicole and the paramedics, past the eave of the apartment building, to the plane as it passes over), so we see how low it is; and because we hear it first and are then shocked by what we see (along with the people on the ground) when it suddenly enters the shot from the top left. And, just at the moment when we think Nicole may be dead, Whip is facing death from above. A lesser director might have handled one or two of these elements in these few seconds of screen time; Zemeckis does them all at once, and makes it seem effortless. That's not to say "Flight" is anything near a flawless movie. There's a scene with the Christian co-pilot and his wife that portrays her as a brain-dead zombie for Jesus. And the mostly '60s and '70s music selections are great songs and great records -- Joe Cocker's (and later, Traffic's) "Feelin' Alright," the Stones' "Gimme Shelter" and Sympathy for the Devil," Bill Withers' "Ain't No Sunshine," Marvin Gaye's "What's Going On," the Cowboy Junkies' version of Lou Reed's "Sweet Jane" -- but they're deployed so literally as lyrics-commenting-on-the-scene that their effectiveness is undermined. Still, I wanted to (quietly) sing along just because the tracks sounded so good. "Flight" would appear to be an attempt to create another "Big Chill" soundtrack album without most of the Motown. There's a beautifully triangulated scene in the hospital stairwell, where Whip first encounters Nadine. What do they have in common? An addiction... to smoking, which is what they've both come here to gratify in secret. He stands next to the door to the ICU, she sits a little above him on the stairs, and they are joined from the floor below by another patient, bald from chemo (unrecognizable as James Badge Dale), who has terminal cancer and a wisecracking gallows sense of humor to go with it. Yes, that character's a cliché, too, and yet he's believable as an individual and not just a type. The way the space is dissected, with the three characters sharing cigarettes on different levels, is quite satisfying without being overemphasized. An imaginative yet unostentatiously conceived dialog scene -- that's something worth celebrating these days. The movie's other most conspicuous shot is the one alluded to above, from behind a hotel minibar, of one small bottle of vodka that looms in the center foreground like the "2001" monolith. This is a fascinating scene: The night before he is scheduled to testify at a hearing in which he will be questioned by NTSB investigator Ellen Block (Melissa Leo). 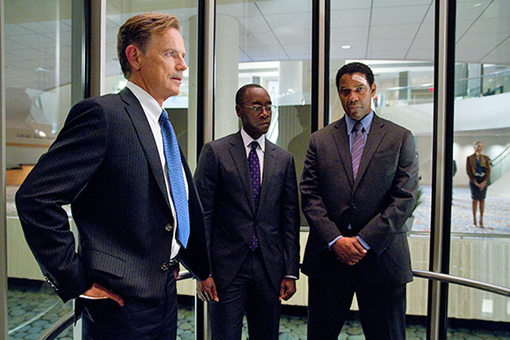 To make sure he stays out of trouble, his lawyer, Hugh Lang (Don Cheadle), and pilot's union rep Charlie Anderson (Bruce Greenwood), put him in a hotel room with a guard outside the door and only juice, soft drinks and water in the fridge. But late at night there's a sound, as of someone gently rapping, rapping at his chamber door. It is a ghost. That is, a unfastened deadbolt lock on the door between adjacent suites, disturbed by air pressure from an unclosed sliding glass door. Now, if it had been me, I would have told the big guy out in the hall to make sure somebody locked that lock now! But not Whip. He goes into the room, closes the balcony door, then spots the minibar. Which he opens. And inside, it's fully stocked. He kneels, caressing a teeny bottle of vodka -- just like the ones we saw him drink during the flight that crashed. He twists the top, and there's that heart-quickening sound of the seal breaking on the aluminum cap: snap. And then... he pauses. Puts the cap back on, sets the bottle on top of the fridge, and exits the shot to the left, returning to his room. Until his hand snatches it out of the frame. By this point, it's become clear that "Flight" is fundamentally an addiction and recovery story. It raises some provocative ethical (and legal) issues along the way. Going in, I thought the central drama was going to be about salvaging or destroying Whip's reputation, depending on whether the accusations were true or false. But we see him drinking right away, so we know the evidence against him is legit. Then I thought maybe the question would be whether, as a heavy drinker, he was really drunk in the cockpit, or if the high tolerance he'd built up over the years made him more functional. It's suggested that his intoxication may have actually saved the lives of the passengers because he acted instinctively without inhibitions. He did what felt right, even though it was not by the book -- something he might not have been so willing to do if he'd been sober. The truth is, crash investigators couldn't find a single pilot who could pull off that landing in simulators, so Whip may well have been the only one who could have saved the day. Likewise, if you drink and drive and you make it home safely, without hurting anybody, even though your judgment and reflexes are impaired (and maybe you do a little lane-swerving along the way), you're as morally culpable as if you'd plowed into a gaggle of schoolchildren. Likewise, if you put a couple bullets in the chamber of a revolver, placed it at someone's temple and pulled the trigger, you're the one who's putting them at risk; if the gun happened not to fire, that's just blind luck. That's Whip: He took it upon himself to risk the lives of everyone on the plane, and hundreds or thousands on the ground; the fact that he landed the plane without killing or injuring most of them isn't morally or legally relevant. In the end (yes, I'm going to talk about the ending, though if you've read this far you've either already seen the movie or don't plan on seeing it) Whip gets away with it... and only then does he surrender. I'm sure some viewers will feel like his decision to come clean is unbelievable: "Why would he confess after he's finally been cleared of responsibility?" The ostensible reason is that he just can't bring himself to drag the dead Katerina down with him. After all, she did the same thing he did (drank a wee bottle of vodka), and gave her life saving a boy who'd fallen out of his seat. But, as I mentioned above, are other, less rational but equally compelling reasons: Only when Whip has successfully beat the system (again), and proved to himself that he can get away with it (as he always has), is he truly free to make a choice; only then can he make a conscious decision to go one way or another. Otherwise, the choice is being made for him by external forces (the airline, the union, the lawyers). He is only empowered when he can make the choice of his own free will, and he knows that if he chooses to lie yet again, he will continue on the same unsustainable course he's been following for years. Nothing will have changed. 1) We admitted we were powerless over alcohol - that our lives had become unmanageable. Yes, Whip does wind up in a twelve-step program -- and in prison. But that's part of growing up and accepting responsibility for who he is (not in terms of maintaining control, but in admitting he needs help and accepting culpability for his actions). People always say that the moment they admit they can't handle the mess their lives have become and concede that they need help, it's an enormous relief, like a heavy burden has been lifted. Whip feels it in that moment, and so do we. As a friend of mine said, "The whole movie is a 'share'" -- and if some parts feel like clichés, well, that's the nature of the beast.